Maximum spectral flatness (approaching 1) is achieved by white noise. Spectral flatness or tonality coefficient, also known as Wiener entropy, is a measure used in digital signal processing to characterize an audio spectrum. Spectral flatness is typically measured in decibels, and provides a way to quantify how noise-like a sound is, as opposed to being tone-like. The meaning of tonal in this context is in the sense of the amount of peaks or resonant structure in a power spectrum, as opposed to flat spectrum of a white noise. A high spectral flatness (approaching 1.0 for white noise) indicates that the spectrum has a similar amount of power in all spectral bands — this would sound similar to white noise, and the graph of the spectrum would appear relatively flat and smooth. A low spectral flatness (approaching 0.0 for a pure tone) indicates that the spectral power is concentrated in a relatively small number of bands — this would typically sound like a mixture of sine waves, and the spectrum would appear "spiky". where x(n) represents the magnitude of bin number n. Note that a single (or more) empty bin yields a flatness of 0, so this measure is most useful when bins are generally not empty. The ratio produced by this calculation is often converted to a decibel scale for reporting, with a maximum of 0 dB and a minimum of −∞ dB. The spectral flatness can also be measured within a specified subband, rather than across the whole band. 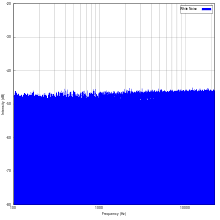 This measurement is one of the many audio descriptors used in the MPEG-7 standard, in which it is labelled "AudioSpectralFlatness". In birdsong research, it has been used as one of the features measured on birdsong audio, when testing similarity between two excerpts. ^ J. D. Johnston (1988). "Transform coding of audio signals using perceptual noise criteria". IEEE Journal on Selected Areas in Communications. 6 (2): 314–332. doi:10.1109/49.608. ^ a b Shlomo Dubnov (2004). "Generalization of Spectral Flatness Measure for Non-Gaussian Linear Processes". Signal Processing Letters. 11 (8): 698–701. doi:10.1109/LSP.2004.831663. ISSN 1070-9908. ^ The Song Features › Wiener entropy "defined as the ratio of geometric mean to arithmetic mean of the spectrum"
^ Luscinia parameters "Wiener entropy is an alternative measure of the noisiness of a signal. It is defined as the ratio of the geometric mean to the arithmetic mean of the power spectrum." ^ Tchernichovski, O., Nottebohm, F., Ho, C. E., Pesaran, B., Mitra, P. P., 2000. A procedure for an automated measurement of song similarity. Animal Behaviour 59 (6), 1167–1176, doi:10.1006/anbe.1999.1416. This page was last edited on 29 July 2014, at 06:05 (UTC).